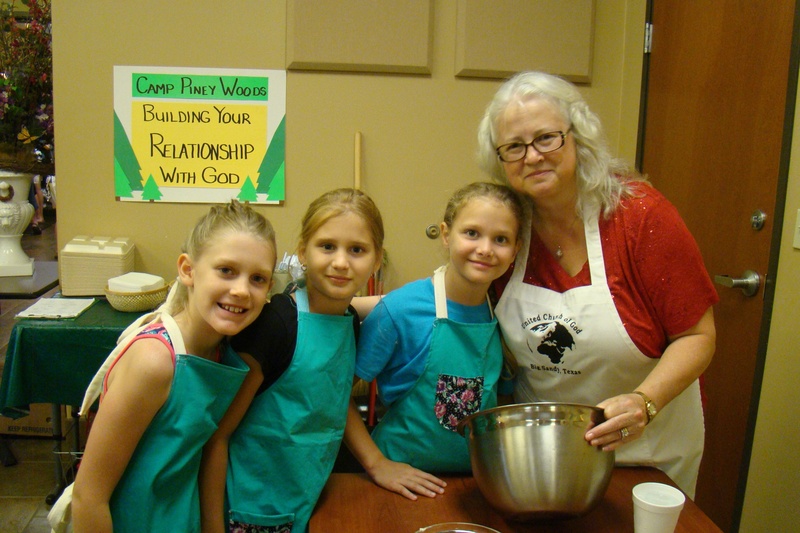 There were 47 preteen campers who enjoyed a very successful camp at the UCG building in the Piney Woods of East Texas. Campers and a staff member at Piney Woods. Twelve teen staff helpers were joined by several dozen adults comprised of imported staff, along with many of the local East Texas brethren. The teamwork and symmetry was evident throughout camp. Fun activities included the boys making leather wallets and the girls making aprons, parachute games, baking, floor scooters, basketball, dodgeball and of course gagaball. Also, the water activities (swimming, fishing, dunking booth, double lane slip-n-slide, water balloon games) are always popular with the warm Texas summers. Our theme for the camp followed the teen camp theme “Building Your Relationship With God.” Our Christian living classes and our activities were based on this theme. We give thanks to our Heavenly Father who has blessed this camp so tremendously. God answered so many prayers that were lifted up asking for His guidance and direction in all that was done. Jim serves as a local elder in the East Texas circuit. He attended Ambassador College from 1990–1994 and currently works in IT at a local hospital. He enjoys sports and loves working with children.